Louis advances on Anna, Sword in hand. Louis gives Anna fatal Sword; a short while later, Broglie arrives. Louis: For a moment there, my STRAIGHT impulses overcame me, but now that I am back to myself again, I can see that STRAIGHT is quite distasteful. Broglie: From now on, leave all matters of STRAIGHT to me. Robin: What have you done? STRAIGHT is the future, and you two have just tried to destroy it! Damn you! Unable to control himself, Robin gives Broglie Pistol. Robin runs away. Meanwhile, in his room, d’Eon reads about HARD GAY when Lia suddenly asserts herself. D’Eon: Aagh, I can’t avoid it- I’m entering Flashback Mode. 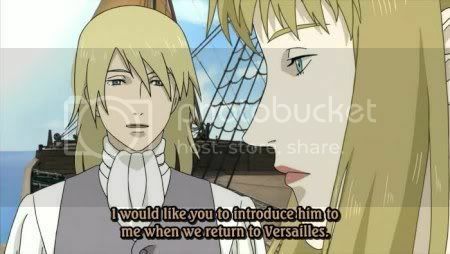 D’Eon sees Lia and Robespierre on a boat to England. Robespierre: Ah, another successful BI session complete. Hey Lia, your little brother must have grown up by now? If he’s as good as you in the bedroom, I wouldn’t mind meeting him when we get back to France. Lia: d’Eon may not be a good choice of partner for you. Robespierre: I bet you just want to keep him for yourself, don’t you? He can’t be that bad- I mean you’ve nominated him to become the main character if anything happens to you. Lia: Well, I discussed it with the writers and they agreed that he was the best choice. Robespierre: Fine- I didn’t really want BI with him anyway. You are all I need, Lia- I’m even ready to marry you and live a life of STRAIGHT. Lia: I would like that. Back in the present, d’Eon screams in pain. Elsewhere, Robin evades the royal guards. Robin: Marie, Anna- if all the women in the series are killed, there can be no STRAIGHT! Robespierre: STRAIGHT is a treacherous thing indeed- place your trust in it, and your partner is immediately killed. Come with me, and I will show you the wonders of BI. Meanwhile, d’Eon is thrust into another Flashback Mode. Robespierre: His Majesty has realised that you and I wish to abandon BI and embrace STRAIGHT together. He’s trying to prevent this by sending me to Russia, a land of rough HARD GAY. Later, Lia is in church when Robespierre arrives. Lia: I see you didn’t like the sound of Russian HARD GAY. Robespierre: Well, I just happened to be in His Majesty’s bedchambers- quite by chance I assure you- when I stumbled upon this Book of HARD GAY. I can’t read it myself, so you must read it for me and tell me the secrets of HARD GAY. Lia: Maximilien, we mustn’t! We promised to go STRAIGHT from now on! Robespierre: Please, you must! Only by mastering HARD GAY can I hold my own in France! Robespierre leaves the book with Lia, who opens it and is given a list of potential HARD GAY partners. Lia: I must not let him see these techniques, or he will leave me forever. Lia absorbs the teachings of the Book into herself, leaving its pages blank. She sends a letter to Robespierre telling him she cannot read the book, and that their STRAIGHT is over. Back in the present, Robin follows Robespierre back to his room. Robin: Why did you save me? Robespierre: Why did you follow me? I think we both know that’s there an implicit attraction between us- and we both wish to act on those feelings. D’Eon has his next Flashback Mode, in which Robespierre visits Lia at night. Robespierre: Lia, I know you read the HARD GAY techniques in this Book! Why won’t you explain them to me? Lia: This sort of HARD GAY is too dangerous to be attempted! No one should ever try it. Robespierre: Don’t think that you will stop me from trying HARD GAY so easily. If need be, I will just experiment by myself. When his Flashback Mode ends, d’Eon runs into the forest. He makes his way into town and visits the carriage driver from earlier episodes. Driver: Are you back for more HARD GAY and HORSE? D’Eon: That’s right, but please don’t mention HORSE so loud in public- I have a reputation to maintain. Driver: Fair enough. So, you’re alone this time, eh? How are the others doing? 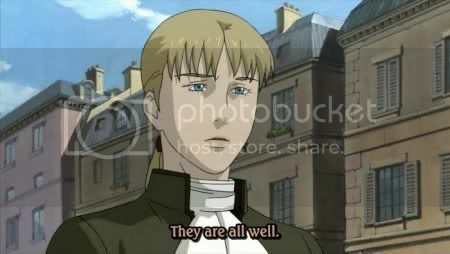 D’Eon: Well, one turned into a Gargoyle and died, another revealed himself to be evil and died, and the third one has disappeared, but overall, they’re fine. Driver: Good to hear it. After he gets into the carriage, d’Eon is thrown back into Flashback Mode. This time, Lia is summoned to see Louis and Broglie. Louis: My important book of HARD GAY techniques has been stolen, and without it I cannot have a good night in the bedroom. Lia, you must retrieve it. Broglie: I hear Robespierre has already hooked up with a Russian lover. At the palace, Louis visits Broglie, who is in bed. Louis: Broglie, I know I said I would sleep with you if we got the Book of HARD GAY back, but it seems that the pages with my favourite technique on them are missing. Broglie: Don’t worry- my generic soldiers are searching for it even now. Louis goes back to his room and looks through the Book. Louis: Damn it, none of these other techniques excite me in the same way! He rips out a page of the Book and throws it in the fire. As it burns, green splotches appear on his skin. Louis: This must be HARD GAY’s punishment for having STRAIGHT and burning a page of the Book. After getting dressed at home, d’Eon comes to the palace, where he hears that Anna has been killed. d’Eon visits Anna’s coffin, and opens it to look at her. He examines her body, even kissing her. 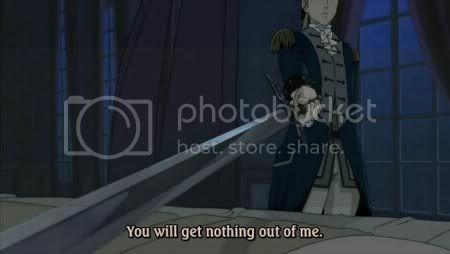 That night, d’Eon takes his Sword and goes to Broglie’s room. Broglie: Sorry, boy, but I’m not interested in HARD GAY with you. D’Eon: In that case, let us go to His Majesty. Broglie leads d’Eon to Louis, who seems to be rotting. Louis: You came back, but as you can see, you are a bit late for HARD GAY with me. Lia: In that case, let’s just tie up loose ends and finish this series!